I love Oatmeal Carmelitas. 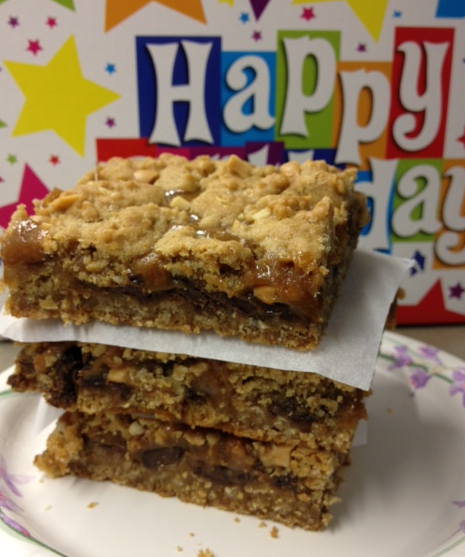 The combination of caramel, chocolate, and oatmeal in a bar is irresistible to me! It had been quite a while since I made a batch, and while looking for a peanut butter and chocolate dessert to make for my friend Amie’s birthday, I ran across the recipe. The thought of these made my mouth water, and I started trying to figure out how to work peanut butter into the recipe. After a little thought, I had it – peanut butter caramel! After all, the peanut butter caramel in the Knock You REALLY Naked Brownies was fantastic, so it should be delish in Carmelitas too, right? I adapted a recipe from one of my favorite cookbooks, Pillsbury: Best of the Bake-Off Cookbook, published in 1996. Just about everything I’ve tried from this cookbook is a winner. The hard work was already done by the Bake-Off contestant, but I think I took a really good recipe and made it even better! Heat oven to 350F. Grease 13 x 9inch pan and set aside. In large bowl, mix all ingredients at low speed until crumbly. Press half of crumb mixture, about 3 cups, in bottom of greased pan. Reserve remaining crumb mixture for topping. Meanwhile, in small bowl, microwave peanut butter for about 20 seconds. Remove from microwave and slowly stir in caramel and 3 T flour. Add 1/2 cup peanuts to remaining crumb mixture and mix well. Remove partially baked crust from oven; sprinkle with chocolate chips. Bake at 350F for an additional 22 – 25 minutes or until golden brown. Cool completely then refrigerate 1 – 2 hours until filling is set.